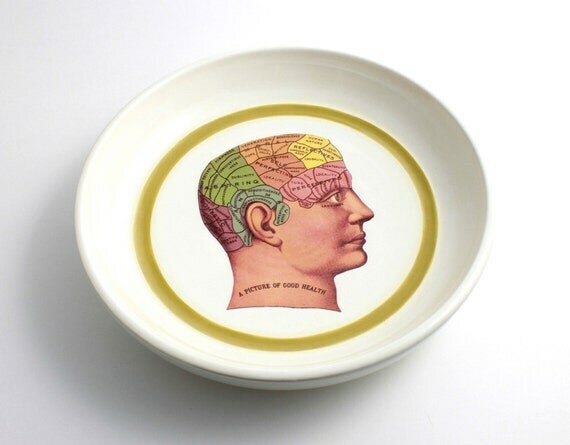 White Bowl with Phrenology Anatomy Illustration on the inside. This bowl is hand-thrown and painted with white underglaze with a shartreuse stripe. I've then added a custom ceramic decal to the inside, of a diagram of the human head divided into various sections as it pertains to the study of phrenology. Great gift for a psychiatrist, teacher, student, or anyone who has an interest in the human mind and history. Decal is fused to the piece and is permanent. Folksy :: Buy "Zing! Crocheted Hat with Vintage Glass Button detail." Folksy :: Buy "Rusty Hanging Metal House - Inspired"